One of the hardest lessons to learn as a currency trader is patience, and not to chase the market but to let the market tell you when to trade and when to sit on the sidelines. The euro dollar at the moment is a classic example of where we need to be patient, and wait for the breakout to be confirmed with a break to the upside looking the more likely at present. However I did say ‘more likley’, but until this is confirmed we wait, and trade in other markets or currency pairs. 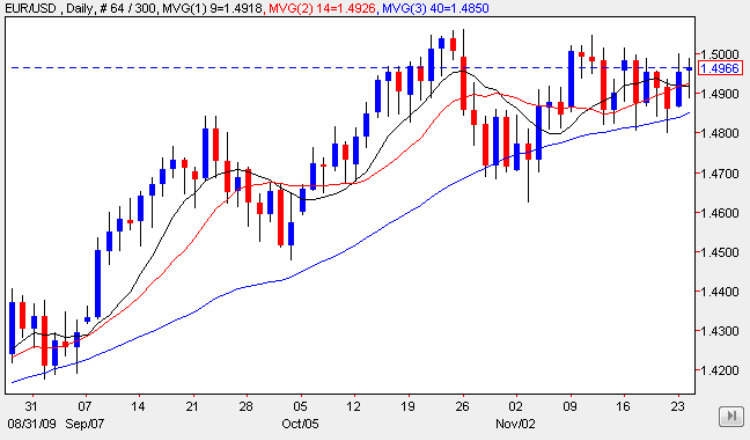 Yesterday’s candle was further evidence that when this break does finally occur it will probably be to the upside, as once again the trend for the low of the day was higher, suggesing that buyers in the market are willing to paying increasingly higher prices as the market edges back towards the 1.5050 price level once again, with the 40 day moving average being the key technical indicator at present. However, only a break and hold above this level will indicate that this is indeed the likely direction for the break, and until then we have to wait and see and let the market come to us, rather then us chase the market. Market moving items of fundamental news today are in the US where we have a number of tier one economic releases: the first of these will be the Core Durable Good Orders forecast to come in at 0.7%, the unemployment claims forecast at 500k (slightly less than previous) and the New Home Sales forecast at 408k – up slightly from previous. In addition the afternoon is also littered with a raft of level 2 releases including the revised UoM consumer sentiment numbers, Personal Spending and Personal Income data and the Crude Oil Inventories which are expected to show a further build. All in all a very busy afternoon!